The Blackboard Student Quick Start Guide is available in PDF format for you to print. Many students find that it is useful to print the document and use it as a reference. 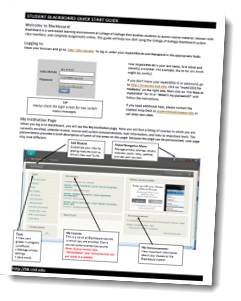 Print version of Blackboard Student Quick Start Guide - Acrobat Reader required. If you prefer to view the document online, the information in it is displayed below for your convenience. Blackboard is a web-based learning environment at College of DuPage that enables students to access course material, interact with class members, and complete assignments online. This guide will help you start using the College of DuPage Blackboard system. To login, enter your myACCESS ID and Password in the appropriate fields. TIP: Always check the login screen for new system status messages. Your myACCESS ID is your last name, first initial and (usually) a number. For example, the ID for Jon Smith might be smithj2. If you don't know your myACCESS ID or password, go to http://myaccess.cod.edu, click on "myACCESS for Students" on the right side, then click on "I'm New to myACCESS" for ID or "What’s my password?" and follow the instructions. If you need additional help, please contact the Student Help Desk at studenthelp@dupage.edu or call (630) 942‐2999. When you log in to Blackboard, you will see the My Institution page. Here you will find a listing of courses in which you are currently enrolled, calendar events, course and system announcements, task information, and links to important tools. The picture below provides a brief description of some of the areas on this page. Because this page can be personalized, your page may look different. To view the contents of a course, click on the name of the course in the My Courses section on My Institution page. You will see the Course Menu on the left. Click the links (or buttons) on the menu to navigate through the course. You may find the syllabus, assignments, quizzes, or other course materials. Instructors can customize the menu, so the menu links and appearance may be different from course to course. Below is a sample screen from a course. Monday to Friday: 7:30 a.m. to 10 p.m. Note: The Student Help Desk will only be able to answer questions regarding accessing the Blackboard system and will not be able to help students with their personal computers or with homework assignments. 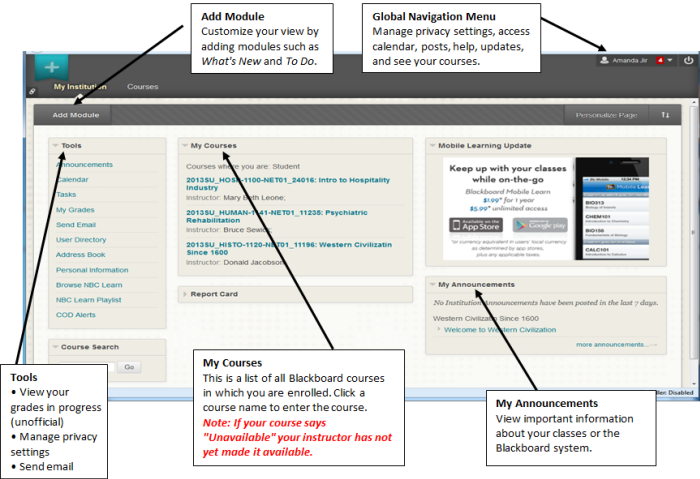 Click the Help button at the bottom of the Global Navigation menu on any Blackboard page. Click the My Email@dupage.edu link from your Blackboard course menu. Or, login to the Student Portal, InsideCOD (http://inside.cod.edu) to access your email. All email communications from instructors and the College are sent to your student email address. You are responsible for checking your college email frequently for important information sent by the college and your instructors. See http://www.cod.edu/it/blackboard/require.htm for software recommendations.